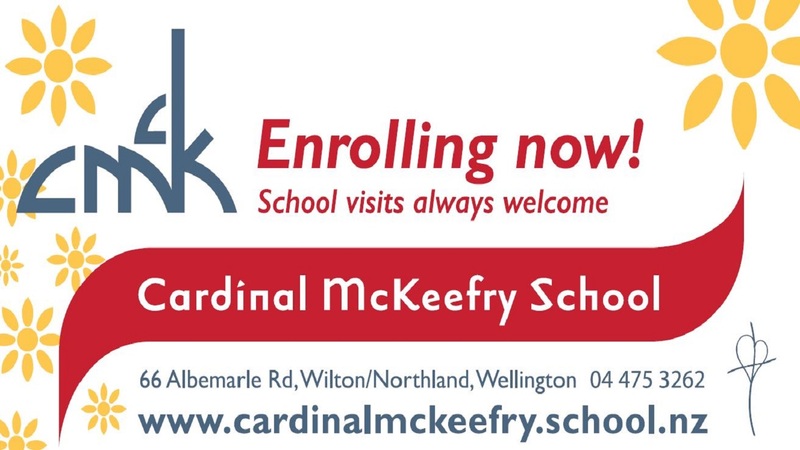 Cardinal McKeefry School is an urban primary school only a short distance by car or bus from either Wellington city centre or the Western and surrounding suburbs. The usual entry points are at Year 1 and Year 7, but we do sometimes have vacancies at other year levels. Please contact the Principal, Tania Savage, to speak with her about enrolling your child or to receive an enrolment pack. A completed “preference of enrolment” form signed by a priest, lay pastoral leader or ethnic chaplain. After acceptance of enrolment, if we haven’t already done so, we usually like to meet with you to learn about your child and to arrange for pre-school visits. Students are granted a preference of enrolment form if they meet one of the following criteria. Please feel free to contact the Principal, Tania Savage, if you have any questions regarding this. 5. One or both of a child’s non-Catholic parents/guardians is preparing to become a Catholic. Cardinal McKeefry School is bound by the Integrated Schools Act and as such can legally enrol a maximum of 10% non-preference students, students who do not meet the above criteria, if there are spaces available. Prior to their actual school starting day, we arrange for school visits for children. This is most helpful in giving new students the opportunity to meet their teacher and the class. Two to three visits are recommended. For those entering our school from Year 2 upwards, we may arrange a transition visit depending on circumstances.